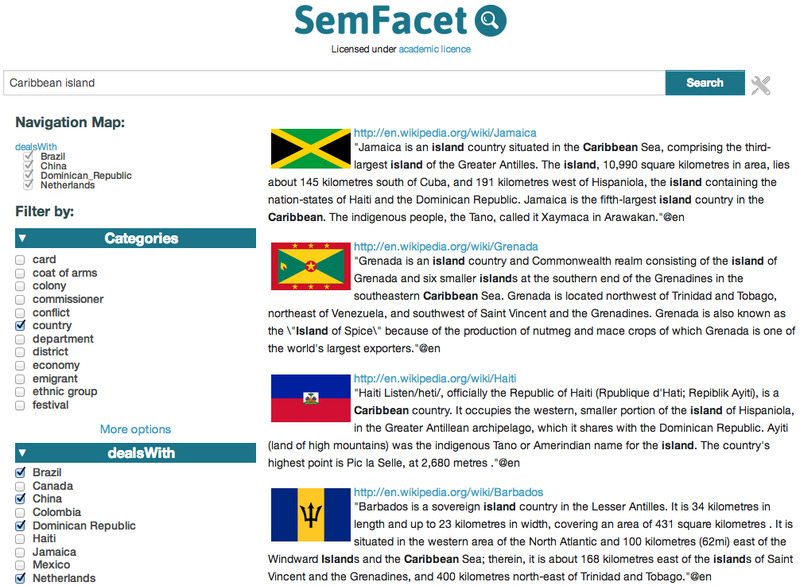 SemFacet is a semantic facet based search system. See the instructions on how to install, configure and use SemFacet. Below you can find SemFacet 1.0 archive, which contains SemFacet.war file. By downloading the SemFacet 1.0 you agree with the following academic licence. If the provided package doesn't work on your machine, you need to compile RDFox yourself following the instruction on https://github.com/yujiaoz/PAGOdA and replace JRDFox.jar in the downloaded war file. If you want to run the project from Eclipse, you could compile the project yourself, for which instructions can also be found at https://github.com/semfacet/core . Search for "JAVA_OPTS" in catalina.sh file in order to find the appropriate place, which will be specified in comments. The system manager displays the current settings of the system. It is possible to change them using Update settings menu item. New data can be loaded using Load data menu item. If you have any further questions please do not hesitate to contact any members of SemFacet. Marcelo Arenas, Bernardo Cuenca Grau, Evgeny Kharlamov, Sarunas Marciuska, Dmitriy Zheleznyakov. Faceted search over RDF-based knowledge graphs. J. Web Sem. 37-38: 55-74 (2016).